Bugs will never be a problem again. Forget about bug bites. It is time to enjoy a great day outdoors, regardless of what you choose to do. 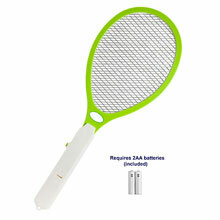 With a simple move the electric bug zapper will remove any bug attacking you and your family. They will be zapped on the spot. 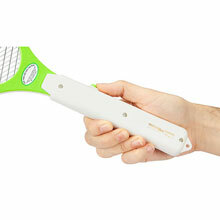 It's incredibly comfortable and practical design will help you rid insects in just one move. 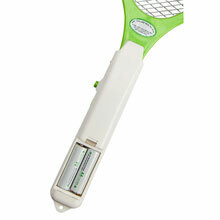 Just swing the device in the direction of the bugs and they will be toasted when they reach its surface. Barbecues and grills will become an enjoyable activity. Keep your food delicious and safe, by not using bug sprays with dangerous chemical content. You don?t need to wonder if the device is on and working. 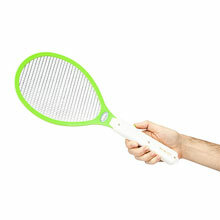 Whenever you press the switch this racket on, a red light will let you know that it is ready for use indoors and outdoors with an additional operating button on the handle for added safety. 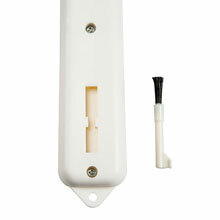 7" wide, 1" deep, 8" long, takes 2 AA batteries (not included). •PRACTICAL DESIGN: Forget about toxic bug sprays, which are entirely unsuitable during a barbecue or when eating outside, this electric mosquito zapper kills wasps, flies, mosquito, moths and all small bugs on contact with an electric charge, safe and effective pest control. 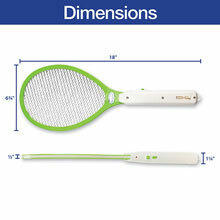 •EASY TO USE: On/Off switch and button control activation, runs high voltage (with weak current so no humans or pets are harmed) through 2 layers of wire net, killing all small insects and bugs effectively. •QUALITY MATERIALS: Constructed with an environmentally friendly durable plastic frame and 2 layers of quality aluminum wire net, 7" wide, 1" deep, 8" long, takes 2 AA batteries (not included). 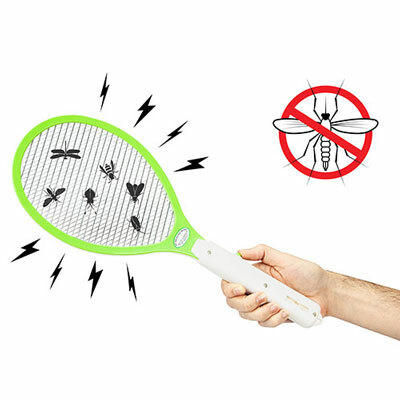 •ENVIRONMENTAL FRIENDLY: This eco-friendly electric mosquito swatter does the job of pest control without and toxic or dangerous chemicals or bug sprays, perfect for use in the kitchen or while cooking on the grill. 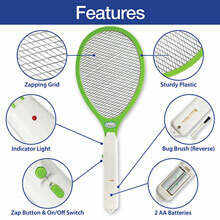 •INDOOR AND OUTDOOR: Use it in the indoors for flies or when fishing, camping or barbecuing, even during the night, swarming bugs won't be a problem for you anymore, just press the button and activate the led from the handle for easy pest control.